Questions about discernment of spirits come up from time to time on my "Open Line" radio show (Thursdays from 3-5 p.m. ET). This has prompted me to study more deeply the Church's spiritual theology and what God has revealed to us through Scripture and Tradition. The more I've learned, the more I see how much I need to learn. As a service to my listeners and blog readers (that's you! ), I bring you some teaching on this subject by the late Dominican theologian, Fr. Jordan Aumann, O.P., an expert in spiritual theology. Signs of the Diabolical Spirit. 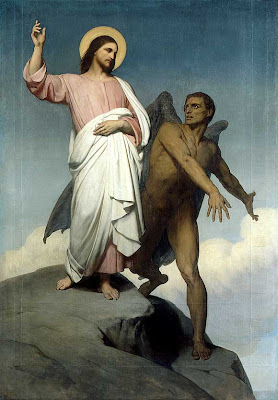 We have already enumerated the signs of the divine spirit, but since the devil may disguise himself as a good spirit and even cause what appears to be authentic mystical phenomena, it is helpful to mention briefly the various signs of the diabolical spirit. 5. Constant indiscretion and a restless spirit. Those who constantly go to extremes, as in penitential exercises or apostolic activity; or neglect their primary obligations to do some personally chosen work. 8. Despair, lack of confidence, and discouragement. A chronic characteristic that alternates with presumption, vain security, and un-' founded optimism. Once the spiritual director is certain that a person is acting under the influence of a diabolical spirit, he should: (1) make the individual realize that he or she is a toy of the devil and must resist his influence; (2) encourage the individual to pray to God for the grace to overcome the devil; (3) advise the person to act quickly and with disdain for the devil as soon as the influence is perceived, performing the opposite from what is suggested or felt. The signs of a purely human spirit have been described by Thomas à Kempis in Book 3, Chapter 54 of The Imitation of Christ. His words should be pondered carefully, for he explains the struggle between grace and the human spirit, wounded by sin and strongly inclined to self-love. The human spirit is always inclined to its own satisfactions; it is a friend of pleasure and an enemy of suffering of any kind. It readily inclines to anything that is compatible with its own temperament, its personal tastes and caprices, or the satisfaction of self-love. It will not hear of humiliations, penance, renunciation, or mortification. If any director or confessor goes against its inclinations, he is immediately branded as inept and incompetent. it seeks success, honors, applause, and pastimes. It is always a great promoter of anything that will arouse admiration or notoriety. In a word, the human spirit neither understands nor cares for anything except its own egoism. It is sometimes difficult in practice to judge whether given manifestations proceed from the devil or from a purely human and egoistic spirit, but it is always relatively easy to distinguish between these two and the spirit of God. It will be possible in most cases, therefore, to determine that a given spirit could not possibly be from God and that it must be combatted, even if one is not sure whether it is in fact from the devil or the human, ego. The following contrasts may serve as general rules for distinguishing between the diabolical and the human spirit. Natural impulses and inclinations are spontaneous; they can usually be traced to some natural cause or disposition; the stimulation of the senses acts upon, the interior powers, and they often persist in spite of prayer. Diabolical impulse or suggestion, on the other hand, is usually violent and difficult to prevent; it arises unexpectedly or with the slightest provocation; a mental suggestion excites the senses and disappears as a rule with prayer. Self-denial and rectitude of intention are excellent remedies against the spirit of egoism. 1. To aspire to some other state in life after having made a prudent and deliberate selection for the existing state. 2. To be attracted to rare phenomena or to singular exercises not proper to one's state in life. When God desires such things he will give unmistakable proof of his will; the test is obedience and humility. 3. An inclination to practice extreme corporal penances. God has demanded them of some souls, but this practice is not in the workings of ordinary providence. 4. A desire for sensible consolations in the practice of prayer or the exercise of the virtues. 5. The "gift of tears" or the strong inclination to concentrate on the sorrowful and penitential aspects of religion. 6. Exclusive devotion to some particular mystery or pious exercise, which easily leads to a distortion of orthodox theology. 7. Extraordinary favors, such as revelations, visions, stigmata, when they occur in a person of little sanctity. The extraordinary graces do not necessarily presuppose sanctity or even the state of grace, but God does not ordinarily grant these gifts except to his servants and friends. By way of conclusion, we again warn directors and confessors to proceed with great caution in making judgments in matters involving the discernment of spirits. It is easy to make a mistake. In cases of extraordinary phenomena, it should be noted that, as a rule, when these things proceed from God, the soul first experiences great fear and humility and then peace and consolation. If these things come from the devil they often begin with feelings of sensible consolation and satisfaction, but later they cause confusion, anxiety, and restlessness. Lastly, apropos of the inclination some persons experience to change their state of life (and usually to go to a higher and stricter form of life), the director will bear in mind that it is quite possible that a grace is given by God but without God's wanting the person actually to change one's state in life. For example, a priest who is actively engaged in the apostolate may experience a strong desire to spend more time in prayer and solitude. In trying to understand the reason for this strong inclination, he may erroneously judge that it is God's will that he enter the Carthusians or the Trappists. Such is not necessarily the case, however, for it may be that the only thing that God is asking of the priest is that he be less involved in the whirlpool of activity and that he dedicate more time each day to prayer and recollection.